But over several years, this concoction has become a set formula and blossomed into a delicious noodle dish on its own merit, collecting adoring fans along the way. It’s a good lesson on how you start out wanting to be like someone else, then you wallow in post-failure self-pity until you wise up and realize that who you are is exactly what you were meant to be all along. And this has prodded me out of my shell to present you this noodle dish without shame. You know how life imitates noodles. The dish still doesn’t have a name, though. And if you make it — and I hope you will — and someone asks you what it’s called, please feel free to give it a name. Anything. Herbert, Eleanor, Pætur, Bjørn, Jamal, Dionysios, Bobby … anything. You need a slow cooker with at least 5 quart capacity to make the amount specified in this recipe. You can halve or double it depending on how many servings you’d like and the size of your slow cooker. The only type of meat which I recommend is beef shank. Everything else turns dry or mushy. I wish beef shank weren’t as expensive as it is. 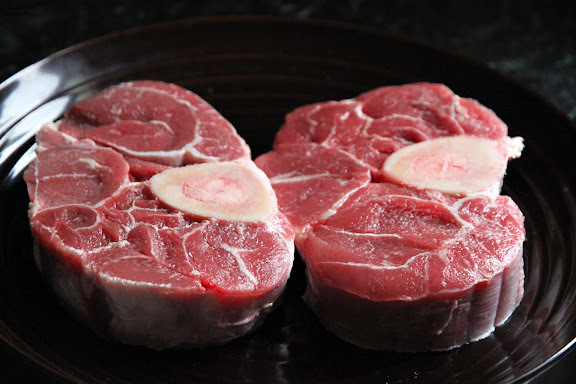 But having been disappointed several times by other types of meat including other cuts of beef, I can’t recommend anything other than beef shank. The amount of collagen makes it an ideal cut for this method of cooking and this dish. If you don’t have a slow cooker, or if you don’t like food made in a slow cooker, feel free to stew it in a pot set to simmer on the stove top or cook it more quickly in a pressure cooker. I know for a fact that the amount of cubed beef shank in this recipe requires at least 3-4 hours of slow stewing on the stove top; I have no idea how long it cooks in a pressure cooker so I’ll let you experiment with different cooking times. Let’s get back to the beef shank. If you normally buy your beef shank from an Asian grocery store, you already know that it comes boneless. This makes things very easy. All you have to do is buying 3 lbs of boneless beef shank, then cutting it into 2-inch cubes. 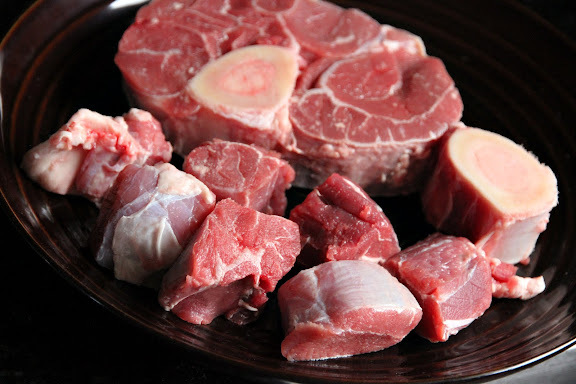 For many of you, the only form of beef shank available is bone-in, cross slices of beef shank that are about 2-inches thick (see photos). Those work as well. Go ahead and buy about 4-4.5 lbs of them. Once you remove the bones (simply run the tip of your knife around the bone to release the meat), that amount should give you roughly 3 lbs of boneless meat. You can throw the bones into the slow cooker to increase the flavor of the broth and fish them out when you’re about to serve the noodles, or you can save the bones to make beef stock later. Why 2 inches? I’ll admit: it’s my preference. From my experience, without fail, what starts out as a 2-inch cube of beef shank will shrink to a 1-inch cube after 10-12 hours in the slow cooker. I think a 1-inch chunk of meat makes for a nice Goldilocks-approved size which fits comfortably on a spoon and can be conveniently consumed in one bite. Start out with smaller pieces and they fall apart; start out with larger pieces and they may be under-tenderized within the same cooking time frame. Whatever you do, don’t trim off what appears to be tough sinews. Those are the best parts. Keep them. The only remaining remark to make is about the noodles. 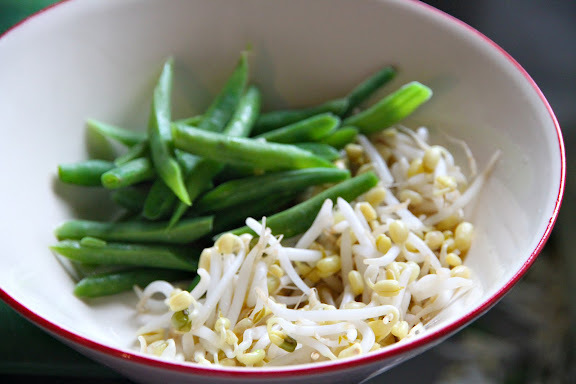 I use the same kind of rice noodles that you use to make Pad Thaias I always have them around. But you can certainly use other types of noodles. Ramen-type egg noodles work very well also. Personally, I’m not so hot about glass (cellophane) noodles in this, but it doesn’t mean they can’t be used. The trashiest and the best? Instant ramen noodles. Just toss the seasoning packet, boil the noodles in plain water, and drain. I shouldn’t be telling you this. In fact, don’t mention to anyone that we had this conversation. Please. The rest is easy. Why shouldn’t it be? It’s a slow cooker recipe; anything more complicated than this would defeat the whole purpose. Oh, three more things: 1. Add the coconut milk at the time specified in the recipe, i.e. after the meat has been sufficiently cooked. If you add it in the beginning, the coconut milk solids tend to seize. 2. The eggs — you can leave those out, if you’d like. Or you can just hard-boil them instead of trying to achieve the runny yolk thing which I’ve done here. The broth is already creamy, and the runny yolks won’t make that much difference. 3. Don’t go ahead and add all 3 tablespoons of fish sauce at the beginning as it will result in the meat being over-seasoned. Add just enough (1 tablespoon) to season the meat while it’s cooking, then add more later to season the broth. Provide additional fish sauce on the table along with fresh limes and dried red pepper flakes, so people can season their noodles to taste just like they do in Thailand. How would I adjust for curry paste that comes in a packet? That’s what my local Asian supermarket carries. Sarah J – I’d start out with two tablespoons. Taste the broth before you add the coconut milk. If you feel that it’s too mild, stir in more curry paste along with the coconut milk. This is a great dish. Love the elegant prose used to describe its origin. Most of all, other than the dish, I really liked the phrase, “life imitates noodles.” I read that and immediately thought, “blog name!” May I use it? USmonzu – Thank you. And, yes, by all means, use it. Now I am ready for dinner … I don’t eat meat often because it is pricey, but when I see something like this, I get hungry for it! I can’t help it, I have to ask (but before I do-great writing as always and yum looks tasty 🙂 ) but truly you tried chuck and it didn’t work? I don’t think I have ever purchased a shank in my life, I don’t think my farmers’ market even carries it…. Laura – I much prefer shank. It’s the only super lean cut that doesn’t become dry or fall apart after hours of cooking in a slow cooker. But you can certainly use chuck. 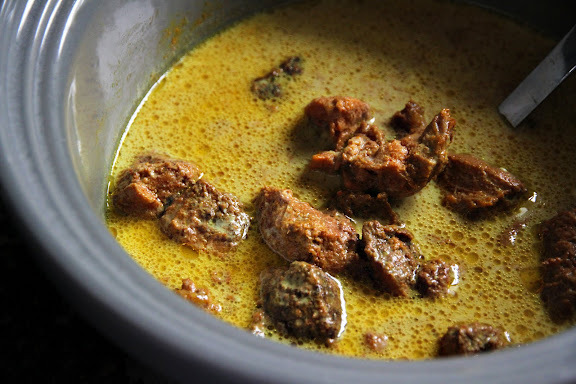 You may have to skim off the beef fat before adding the coconut milk otherwise the sauce gets very oily. Anon – Thank you. No, this one is actually made with rice noodles. They’re just tinted yellow by the turmeric in the curry. Slow cooker – check. Ingredients – check. Making this for dinner tomorrow night – check. Check? – check!. Looks delicious – I will wake up my slow cooker from its coma and give this a go. Love your blog! Made this for dinner tonight, delicious! I just wanna say that I made this for dinner the other night, after picking up all the items from an Asian grocer near my workplace. It tasted like incredible! None of my attempts at Asian cooking have hitherto tasted this good, or as close to what I imagine the Real Thing would be like. This recipe is a keeper. Thanks so much. I tried this the other day and it was fantastic! My boyfriend and I like spicy, but using the whole can of curry paste was too much for us. Also, this was the first time I’ve cooked beef shanks and it was delicious! 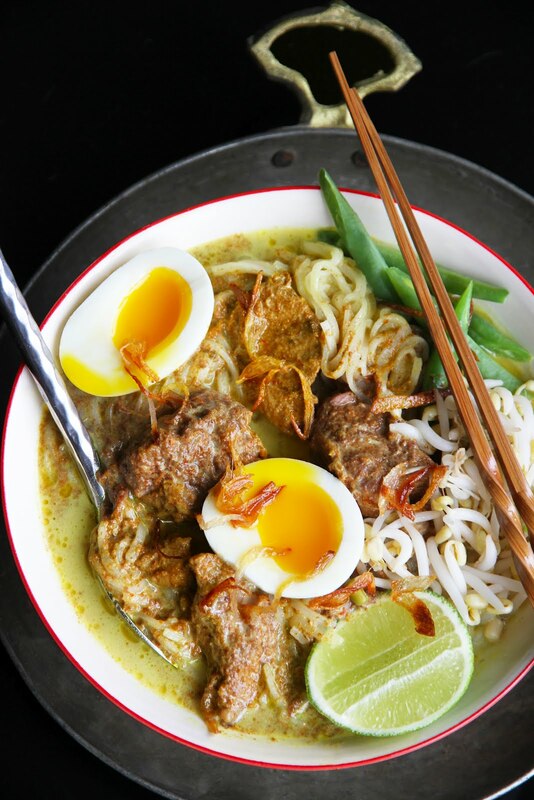 My boyfriend grew up in Burma and he said it reminded him of mohinga. Will definitely be making this again! Just made this and it came out perfect. I added a few extra veggies. Used the masman curry. Love this. Thank you!